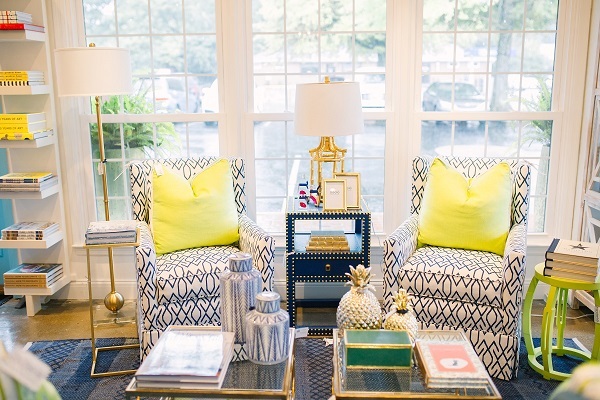 At Adelé, located in Chevy Chase, our collection of designer home décor fabrics is outstanding. Adelé is locally owned and operated.Since 2011, we have continually offered the best designer home décor fabrics for today’s lifestyles, while keeping our focus on excellent value and customer service. Adelé offers designer wall coverings and custom window treatments, as well as beautiful upholstery fabrics. Our collections feature a broad selection of designs, patterns and colors developed for striking home décor. The difference between Adelé designer home décor fabrics and regular fabrics is what sets our fabrics apart from mass market products, a much higher standard of manufacturing and design. Our designer home décor fabrics are of a superior quality than other fabrics. Our design team searches the designer markets to bring you an outstanding collection of gorgeous home décor fabrics. The breadth of style options and richness of patterns, textures and colors infuses our designer wall coverings, custom window treatments and stunning upholstery fabrics with unsurpassed beauty. Robert Allen | offers coordinated print and woven collections that are designed with an aesthetic and user-friendly focus on what fits comfortably into the home. Beacon Hill | crafts textiles of distinction, rich in original design, exceptional beauty and truly one-of-a-kind. Brunschwig & Fils | traditional yet whimsical patterns, created with a loose artistic hand and soft subtle colorations. Clarence House | selected as the #1 luxury brand of fabric and wallpaper by Elle Décor’s survey of interior designers. Designer’s Guild | a great collection of weaves, plain essentials, silks, wide width fabrics, voiles and taffetas. Duralee | continually creates palettes and styles with comfort an authenticity, injecting a heavy dose of what’s now and what’s timely. Lee Jofa | one of the interior design world’s top-notch manufacturer of fabric and wallpaper. From timeless to contemporary, Lee Jofa has an array of superior patterns. Kravet | is a leader in the interior design industry, offering the widest range of colors, patterns, textures and styles. Osborne & Little | one of the world’s leading names in fabric and wallpaper designs has grown into one of the great British brands, globally renowned and respected. F. Schumacher | a great selection of prints, patterned wovens, sheers, embroideries, plains, textures and velvets. Thibaut | offers unsurpassed quality and great designs in styles ranging from historic reproductions and traditional, classic patterns to tropical and novelty patterns. You will immediately see what makes Adelé extraordinary the moment you enter our store. Our standard is to treat you like a loyal customer before you order anything. We are here to answer any questions before and after purchasing from us. We also stand behind the great quality of our designer home décor fabrics. Come visit us at Adelé in Chevy Chase at 805 Chevy Chase Place, next to Josie’s. You can also visit us online at adelelexington.com.